Lumber acclimation is a topic that will get a lot of opinions. A few days may not be enough, depending on how different your climate is to where it was stored and where it will be used. I like to store mine inside the house for a few weeks. Not sure if that is too long or too short. You are using quarter sawn material, so that helps stability a lot. Also, a lot of the famous guys say they try and mill the boards and joint them the same day, to alow the joinery to limit how much the wood can move. If you are buying material much thicker than what it will be when you use it, partial milling, then waiting before final milling can be helpful. The thirng to remember is….wood moves. Nothing stays flat and nothing will remain perfect. Straight, flat and square really mean straight, flat and square enough for the intended purpose. I question the wisdom of putting something as precious as your grandchild in a crib that is your second woodworking project. Even if you research every safety requirement for cribs, one bad joint, or one design mistake, could cause a failure that might harm the child — or worse. Kids start teething while they are still in a crib, so you have to be careful about what finish you use, because they will chew on it. There are countless standards that have been developed over the years as a result of tragedies. There’s a reason that cribs are UL listed. 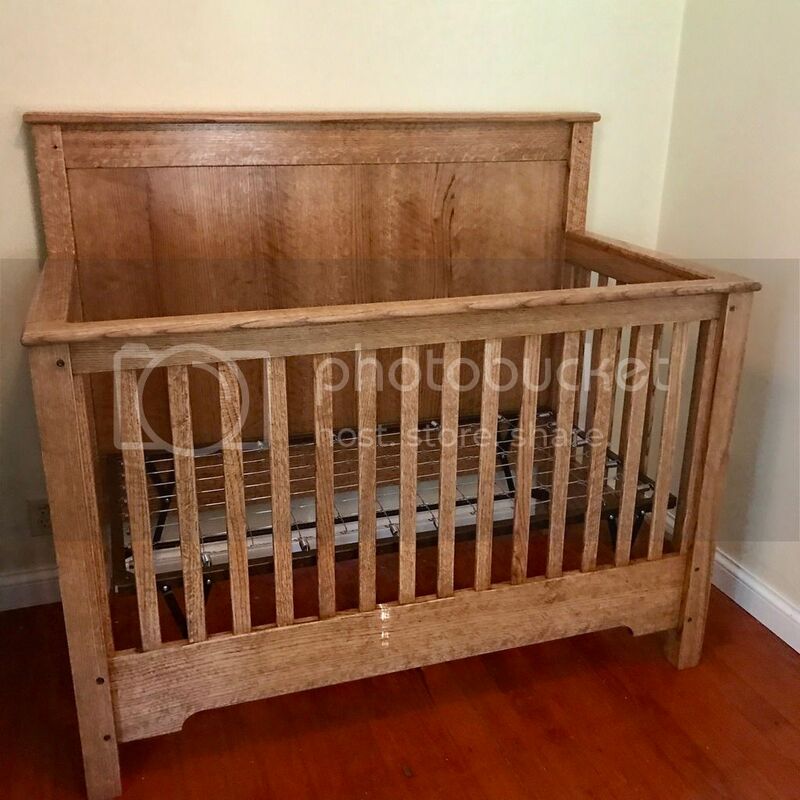 Sorry to be a party-pooper, but I’ve been a woodworker since I first started helping my dad in the shop in the early ‘60s, and have grown to a fairly advanced skill level in the past 20 years or so, and there is no way I’d build a crib. I could do it, and it would have a virtually zero chance of failure, but if it did fail and harm a child — even if it wasn’t due to my error — I’d have trouble living with myself. Virtually every hard curing finish such as poly, is safe to eat once cured, as they are biologically inert at that point. If you are worried, just use shellac. The exact same stuff is already on much of the food you eat and the pills you swallow. In terms of the crib failing, that is your risk tolerance. Cribs aren’t allowed drop sides anymore so that makes them a box, basically, which is less risky. It would be wise to look up the rules on bar spacing and side height. Using wood acclimated to my shop, I like to cut everything with one machine set – plane all boards that will at each thickness together, rip all pieces that will be the same width, crosscut all pieces that will be the same length. I prefer to cut everything before starting assembly, prep for finish, then do a dry assembly, and then hopefully put it all together without remakes. This is with kiln dried rough cabinet grade 2s wood that I’m not resawing or planning off a 1/2”. With dry acclimated wood, most of the time, most of the movement occurs within a fairly short time of the cut as internal stresses are relieved – there’s always exceptions. A lot of the answers to your questions will depend upon the moisture content and dimensions of the rough lumber. It might be a good idea get yourself a moisture meter to see what the moister level of the rough lumber is but in general, it is better to mill the rough lumber in 2 steps—once to get close, wait at least a week and mill to final thickness. This helps let the internal stresses that you release when you initially mill do their damage so that you can correct any movement you see before final milling. Thicker wood will usually have a higher moisture content and may be more prone to movement after the initial milling. The quarter sawn wood will definitely reduce the problems significantly but you may still see movement caused by differences in sapwood and the wood near the pith (center rings) so it may be worthwhile to trim those off during the initial milling when possible without sacrificing too much wood or needed dimensions. As to your question about milling and cutting all at once, that may be determined by how much movement you see after the initial milling. If it is minimal and your shop environment if fairly stable, you can probably do it all at once. If not, you may have fewer problems if you only prep what you can complete in a few days. I’m not at all worried about a failure. I found the CPSC rules and followed them carefully. I prefer to mill all the parts and then assemble. If the boards are from the same source and have been held at the same conditions, then they will tend to move alike. No two boards are exactly the same, but usually they tend to move the same if they are the same species, from the same source, maintained the same way. If they are from the same tree, even better. The best advice I know on milling is stabilize in your shop, mill to a bit bigger than final dimensions, wait overnight, then mill to final dimensions. If your material isn’t very thick, and has been held in your shop long enough to completely stabilize, then just mill to final thickness from the get go. Cut your boards a bit long and keep them long until you are ready to cut the joints. Sometimes, it’s easier and faster to leave small pieces as a longer board to joint and plane it, then cut to rough length. I echo RichTaylor’s words of caution. There are two projects that I would not consider building; the baby’s crib and a high chair. While the risk of the project failing could be very low and maybe I would design in all the needed fail-safe safety features, the consequences of an accident that hurts my Grandchild would really bother me. Additionally, the crib is used for only a little while. On the other hand I would not hesitate to design and build a toddler’s bed when the child gets a little older. A reasonably accurate moisture meter used properly to gauge the moisture content of the rough lumber would be beneficial if trying to follow the Forest Service’s recommendations. Otherwise it is kind of a guess. Whenever possible, I like to bring rough dried project lumber into the workshop when I first start the detailed design work. It generally takes about 2-3 weeks for me to complete the design. I figure the lumber is acclimated to the shop environment by the time the design if finished. Of course if I guess wrong and have too little acclimated lumber to finish the project, I either have to wait while the additional lumber acclimates or take my chances. I have built projects both ways you suggested; initially mill all the project lumber to final width and thickness and at rough lengths at the project’s outset and sticker until I am ready to use it. I also have milled lumber as I need it for a sub-assembly. Either way, I spent a day making a bunch of sticker sticks, equal lengths of straight wood that are ¾” x ¾”. Once the lumber is milled and panels are glued, the prepared lumber is stickered with these sticker sticks. The airflow all around the lumber seems to help a lot in keeping the milled lumber flat and straight. My feeling is that once the one face of rough lumber has been planed, the clock is ticking. That freshly milled surface can probably release or absorb moisture more readily than the un-milled face. Therefore, I try to plane the remaining rough face the same day or the very next day of jointing the first face. I do not worry much about the edges, but then I tend to mill both edges straight all at once sometime later. Best practices are probably to mill the lumber to rough dimensions, sticker the milled lumber, and complete milling to final dimensions a day or two later. In my experience, I have yet to find this method necessary. But this probably goes back to how well the lumber is acclimated to the shop environment and a bit of luck. All – thank you for your input, I appreciate your time. Great suggestions and valid concerns. 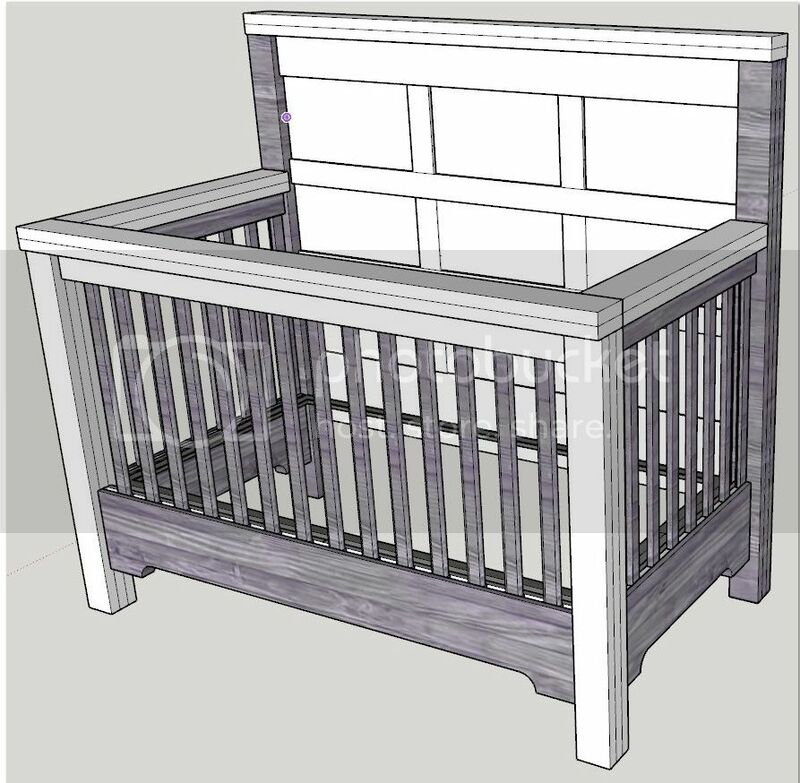 I’ve designed the crib where it will transition into a toddlers bed and then into a foot board and head board. I’ve attached the basic concept for the crib. I will have a new front section that will have an opening to allow the toddler to access the bed on his/her own. When that is out grown, the current front and side rails will all go to storage. The head board will be set to accept either a bed frame or maybe side rails to tie into a foot board for use with a full size mattress. Thank you for all the input. The crib is complete and my daughter loves it. That alone leaves me satisfied. As this was my first time using rough cut lumber, i learned a lot along the way and look forward to the next project. Lots of mistakes and learning in front of me. Nice looking crib, and I like how you designed for the future.